Facebook is giving advertisers and developers the ability to target ads at specific smartphones and tablets. The new parameters will allow them to specify not only a specific mobile OS, such as Android or iOS, but also individual devices and the firmware version being used. As an example, an advertiser or developer would be able to deliver ads only to people who are using an iPad mini with Retina Display – and target devices that are running at least iOS 7 or higher. In addition, Facebook will also allow developers to target devices with specific connectivity, such as Wi-Fi-only. The new targeting options should appeal to app developers in particular. Updates are often limited to specific devices – Facebook Home, for instance, is only available on a small range of Android smartphones – so being able to tailor ads accordingly should give them a greater return on investment. Similarly, if any devices are no longer compatible, it will soon be possible to simply filter them out – ensuring developers are only reaching people who could be potential users or customers. 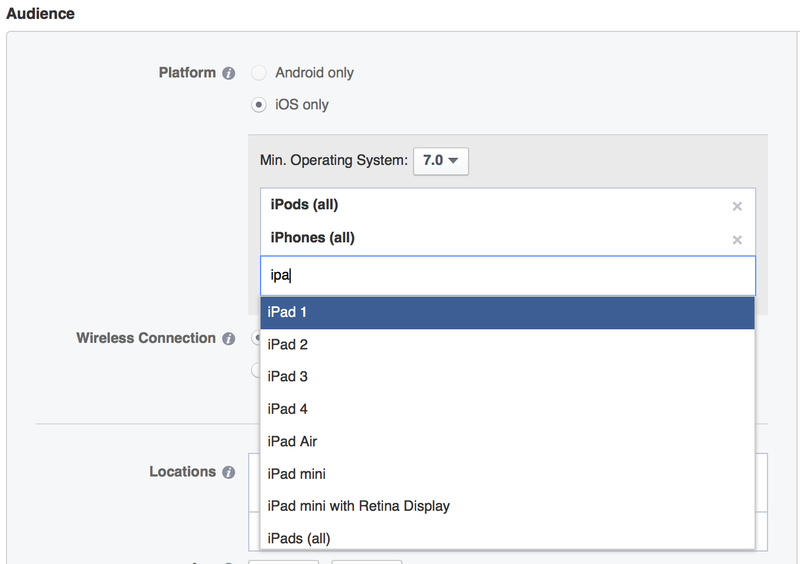 “This reduces development time as you only need to build to devices best suited for your app,” Facebook added. The new tools should be available to advertisers and developers “in the next few days.” So if you can’t access them just yet, hold tight – they’re coming.